As longtime second top coffee producer in the world, the Southeast Asian country of Vietnam is doing something right. 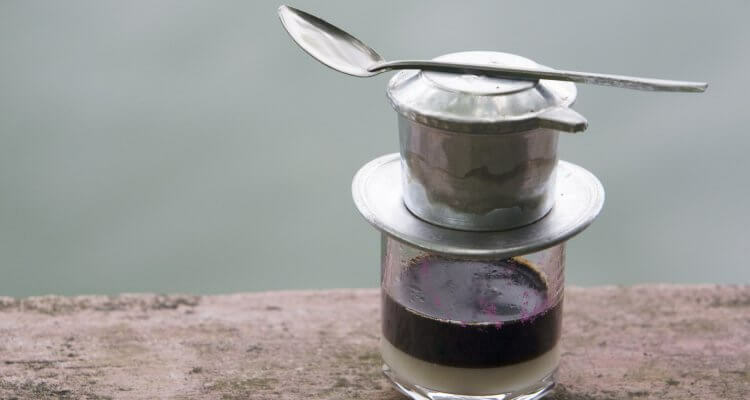 Indeed, there are several reasons why Vietnamese coffee is some of the most sought after coffee in the world; many have to do with the cultivation process(es) and culture surrounding the country’s most prized commodity. French colonists introduced coffee to Vietnam in the 19th Century. 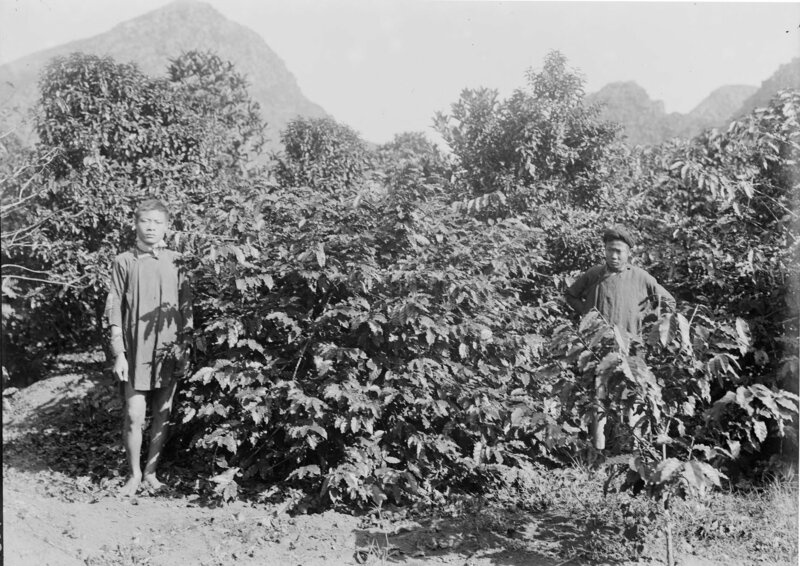 Around the year 1890, the French were successful in creating a booming coffee industry in the Annam region (a long stretch of mountainous plateau extending through several countries). By 1950, a commercial processing plant was established and Vietnam became serious about coffee production. Although other countries in Southeast Asia (like Laos and Cambodia) were earlier contributors to the coffee trade, it was Vietnam that ascended the ladder to become the continent’s top producer. 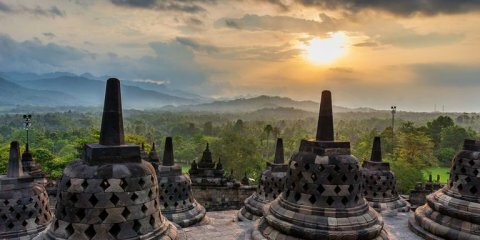 Unfortunately, the Vietnam War left the country’s economy in shambles in 1975. After some years of struggling, the country instituted aggressive agricultural reforms. By the 90s, Vietnam’s coffee industry was booming again. The economy is doing well thanks to the country’s coffee industry. Vietnam has seen a huge population influx in recent years, with many people moving to the country to find jobs in its illustrious coffee trade. Today, Vietnam’s coffee production employs over 2 ½ million people! In Vietnam, there are several coffee bean varietals; this myriad of coffee allows Vietnamese coffee producers to create unique multi-origin blends not found anywhere else in the world. Robusta varietals make up 97% of the country’s coffee output. This abundance of variety is due to growing regions spaced throughout the country so that many different growing climates are utilized. Extensive research on the topography of Annamite Plateau, for example, reveals that it is situated in such a way that many different microclimates are present. 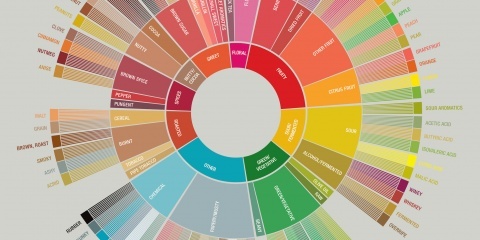 With so many options available, it only makes sense for the country to offer a varying multitude of one-of-a-kind coffee blends. The final result is a mixture of superior taste, bolder flavors, and a lingering satisfying aftertaste. Vietnamese coffee roasting preferences have been established for many years with many different methods implemented throughout the country. Historically, Vietnamese coffee beans were roasted in a caramel like oil (often mixed with sugar, vanilla and/or cocoa), which enveloped the coffee beans with a sweet coating- giving the coffee a rich unique flavor. The coating also darkened the color of the beans during the roasting process, without burning them, which gave the batch as a whole a more uniform look and taste. Modern day Vietnamese coffee growers do not usually use the above method and rather roast their coffee beans in a “butter oil”, which helps the beans roast more evenly. Most coffee from restaurants or cafés comes in large sizes, encouraging patrons to sit, relax, and sip for a while. You do not take a coffee “to go”; if you order one, plan to camp out for at least an hour or two. I know- twist your arm, right? There is a healthy blend between traditional and modern coffee shops, both with their own unique charms. Older crowds gravitate towards the more classic Vietnamese coffee houses- where they can sit all day reminiscing, playing endless games of checkers- while the younger crowds are more interested in the modernized coffee houses which boast a more eclectic artistic atmosphere. 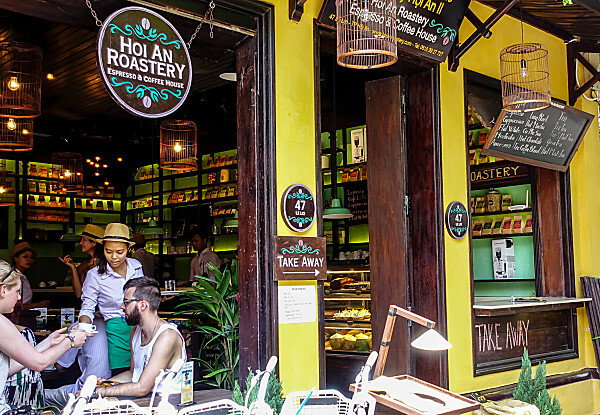 If you want the best of both worlds, Hanoi, Vietnam’s capital city, is the epicenter for coffee culture; there’s even “Coffee Street”, which hosts more coffee shops per square block than anywhere in Vietnam. No matter which coffee house you choose, you can be sure that many types of Vietnamese coffee are offered there. 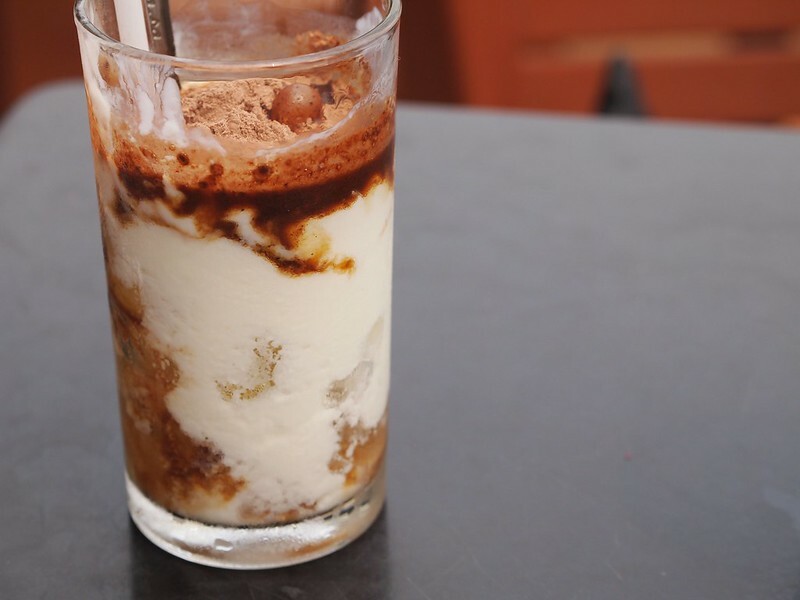 This recipe is a cousin of the popular Vietnamese Iced Coffee. Check out Atlas’ how-to article to learn how to make Iced Vietnamese Coffee at home! Pour ground coffee into the bottom of the filter. Screw the top of the filter on, so that it fits snugly. Note: if the lid is too tight, it will compact the coffee. Place filter over top of coffee cup or mug. and pour ~ 5 Tbl. boiling water into it. 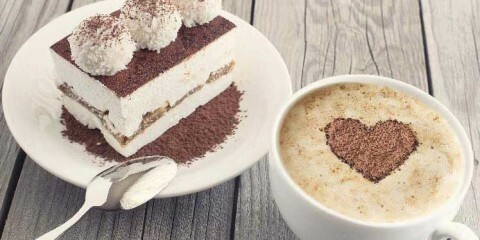 Let sit for a few minutes to allow coffee to soften. Pour boiling water into filter until filled. Wait 4-5 minutes for coffee to finish dripping. 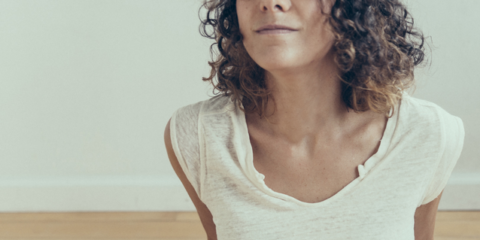 Want to learn about coffee culture in other countries? Check out our posts about Traditional Indian Coffee Culture, Traditional Greek Coffee Culture, and Traditional Irish Coffee Culture– all with recipes included for iconic coffee beverages from each country!